Kansas budget cutters: the time has come to get real and very specific. Which expenses can be cut to balance the state budget? What’s your plan? 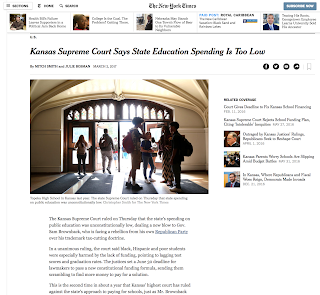 Put out the details so that Kansans can judge the best course of action. That kind of talk nurtures a popular stereotype of government, but does it at all ring true in Kansas anymore? If true, those saying such things should have no trouble naming the spending that needs to be eliminated. Surely, with the financial health of Kansas on the line, would-be budget cutters can muster specificity. In the wake of a new court ruling, what part of school funding can be cut? Saying “put students first” is not an adequate answer though. How about chopping Medicaid? Doctors, hospitals, and nursing homes providing services had their Medicaid reimbursement rates cut 4 percent this year. Can that cut be made deeper? Vast amounts of money have been lifted from the highway fund, causing many road projects to be cancelled. Should Kansas spend even less on highway maintenance and bridge repair? State employees have not had a raise in 9 years. How about making it 10? Or maybe cutting their health benefits can save money. Without specifics, claims of an inefficient, overspending state government come up empty and lead nowhere. When explaining his recent veto of a revenue-raising bill, Gov. 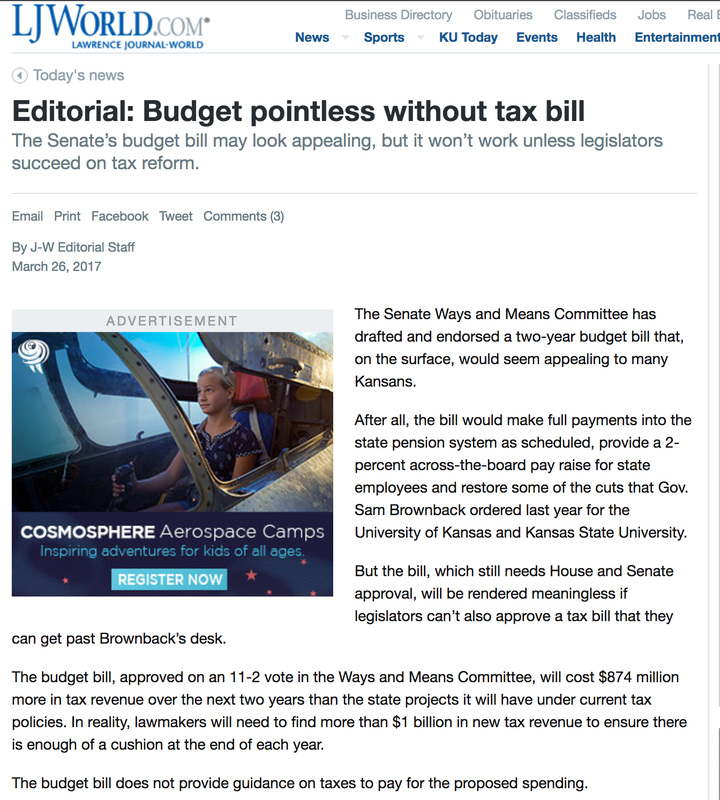 Brownback chided lawmakers for not considering more expense cuts, but his own budget does not show the way. His main proposal to reduce spending shorts the required payments into the already precarious public employee retirement fund. That’s like a homeowner skipping mortgage payments. It doesn’t actually eliminate the expense, just piles it onto the obligations in future years. Kansas faces a festering budget gap between income and expense that now exceeds a billion dollars. Only two approaches can effectively solve the problem: cut expenses—in a real way—or raise revenue. Lawmakers have not done enough of either to cure the structural imbalance in the budget. Instead, they have resorted to short-term patches that kill Kansas financially—blowing through the reserves, borrowing, putting off bill payments, raiding the highway fund, trying to sell assets. With each of these maneuvers, Kansas has become poorer, but without fixing the problem. These misguided efforts have to stop. If there was ever a time for serious budget cutters to shine, this is it. Put your proposals out on the table and explain them. But if you are only able to talk in generalities, don’t waste everyone’s time. Either offer credible ways to reduce expenses, or let the Legislature proceed to rollback the 2012 income tax cuts.